Kenzo has launched its perennial limited edition, Flower By Kenzo Summer Fragrance, for summer 2008. In fact, it is a new version of the brand's classic Flower By Kenzo fragrance. The original Flower By Kenzo was introduced in 2000. Since then, the Flower By Kenzo collection has increased to different variations, including the famous Flower By Kenzo Le Parfum (2003) and Flower By Kenzo Oriental Eau de Parfum (2005). Like the other fragrances in this Flower By Kenzo line, Flower By Kenzo Summer 2008 was created by master perfumer Alberto Morillas. The bottle of Flower By Kenzo (2000) was originally designed by French sculptor Serge Mansau. The bottle is leaning and slender with the image of poppy flower. Since then, different variations of Flower By Kenzo feature different pictures of poppy flowers on the bottles to reflect their own natures of scents. 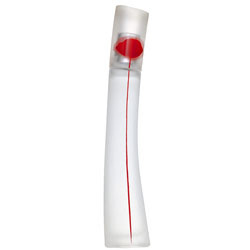 For the summer 2008 limited edition, it comes in a frosted glass bottle with the image of red poppy flower. The bottle has its own unique beauty, and the design is hard to forget. Flower By Kenzo Eau de Parfum Summer Fragrance 2008 features top notes of litchi (also known as lychee), ginger and mandarin; middle notes of freesia and parma violet; base notes of incense and white musk. This fragrance starts with sweet powdery and spicy notes. The nuances of ginger and mandarin orange deliver a nice sense of freshness, but the floral notes are too sweet and too powdery for my taste at first. As the fragrance settles in 5 to 10 minutes after application, the sweet notes start to succumb to the woody tones, and recede into a soft floral finish. The woody-musky base notes of incense and white musk provide a delicate sensation to the skin, and lead to a harmonious composition. Flower By Kenzo Summer 2008 features the splashes of fresh spicy nuances and soft floral accords accentuated by woody and musky base notes. I do find the powdery notes featured in the floral scents don't really appeal to me. Overall, Flower By Kenzo Summer 2008 is a well-rounded and unique fragrance for me. The scents are reminiscent of feminine, elegant yet modern and independent characteristics. The woody, musky and floral scents of this fragrance are more of a fragrance I would wear in the cool and crisp weather like fall or spring. For people who like floral fragrances with woody or musky base notes, this fragrance is worth a try!